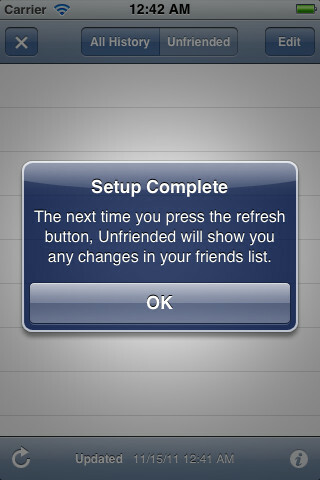 Developer Quote: "Unfriended will show you exactly who removed you as a friend and who deactivated their account. " How large is your Facebook account? If it's over 50 people, it's too hard to keep track of all those status updates or activities of friends. If it's up to 500 folks, heck OJ Simpson could be on there, and you wouldn't even know it! I keep my account limited purposely so I can truly interact with my friends, and not just maintain a mass of people whom I may have met once in the past. Still, I'm never quite aware if anyone has unfriended me or deactivated their own account. Once or twice I've seen the account decrease by two, and wondered who the heck decided to wander off! It's pretty easy with Unfriended to see exactly what's what with your Facebook account. It's the simplest app to use and very small in space as apps go. Basically you open the app and see tabs for History and Unfriended, along with an Edit button on top of your display. There is a refresh button to the bottom left of your screen. Tap that and it will sift through your Facebook friends and let you know on the spot if any changes have occurred. It's simple-no bells or whistles, just a clear answer. If all your friends are still there, you will see a message, "There are no new changes in your friends list to display." Fortunately, today all was well with my Facebook account, so I don't have an alternate answer to that one! One caveat here: Unfriended will only display results for who deactivated or removed you as a friend AFTER the time you installed this app. Therefore, after installing, you may wish to wait a day or two to check out the number of your friends on Facebook. And, remember, it doesn't really matter who unfriended you! You are an awesome person, and that other person is losing out on great interaction with you if he or she decided to retract a friendship! 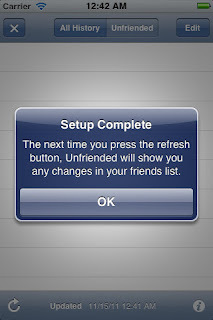 COOL CONCLUSION: "Unfriended makes it simple to quickly view if anyone has unfriended you or deactivated his or her Facebook account."